Australia’s Melissa Tapper can’t believe it’s already been one year since the Rio Olympics, and neither can we. In this Rio Review we follow Tapper has she looks back at her history making appearance at the 2016 Rio Olympic Games. There is no bigger stage for an athlete than playing at the Olympic Games, and Melissa Tapper’s dream of competing was finally realised when she set foot in the Rio Centro stadium. For Tapper, it wasn’t just about her individual achievement out on the court. For her, table tennis is a family affair. She needed all the support she could muster, because when the Aussie came out to compete in her first match, she found herself up against more than just one opponent. It was a loss for Tapper, but the applause from the supporters back home echoed over the Pacific Ocean, all the way to Rio. Unlike most athletes at the Games, when the curtain closed on the Rio Olympics, Tapper was back in the training hall. There was another milestone on the horizon. 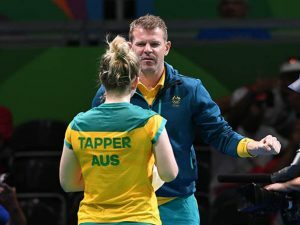 As the first Australian to qualify for both the Summer Olympics and the Summer Paralympics, Tapper had a historic appearance to make soon after the Olympic Games, competing in the Class 10 Women’s Singles at the Paralympics in Rio. Unfortunately for Tapper, she couldn’t find the medal she was after. Dealing with disappointment is part and parcel of an athlete’s life. Tapper knows she has to treat the thrill of competing in Rio equally to her disappointment in losing out on a medal. And while Rio is an experience that Tapper will never forget, it is onwards and upwards from here.